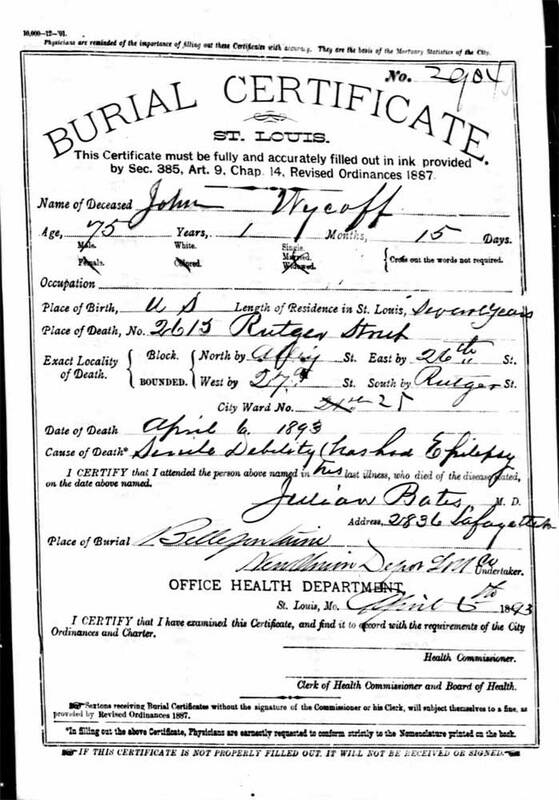 52 Ancestors: #15 ~ Joachim WYCOFF ~ How Do You Spell That? The night before we left for our camping weekend, it occurred to me that maybe the place we were heading off to for camping had something to do with the family history, so I jumped on the computer and searched for a connection to Tomlinson Run. 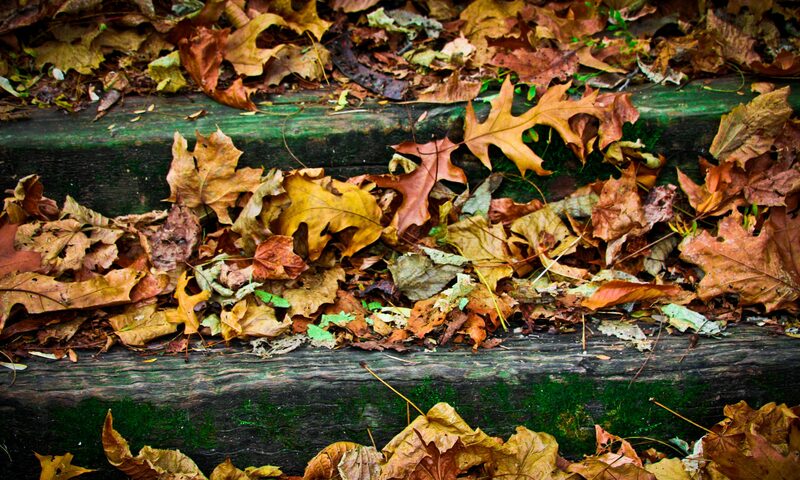 In the thirty-plus years that I have been researching, I tend to take breaks where I don’t do much except maybe update information from obituaries or, perhaps, I veer off into a different direction on some other family line. I don’t find it an easy task to hold specific information in my head at all times about the family. (It’s possible that this is age related.) When I found the connection, I was a little shocked that it hadn’t come to me sooner. 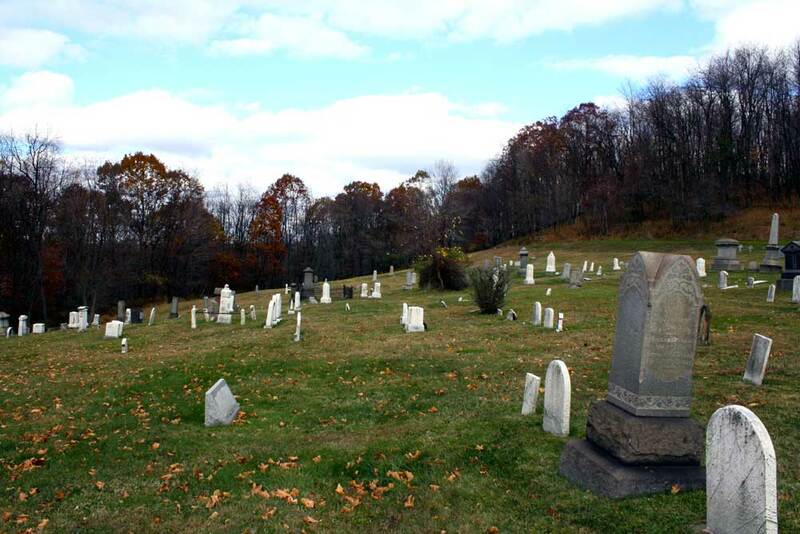 My 5th great-grandfather, Joachim Wycoff, had settled in this very area and, from checking out the map, it looked as if he was buried not far from where we would be camping. 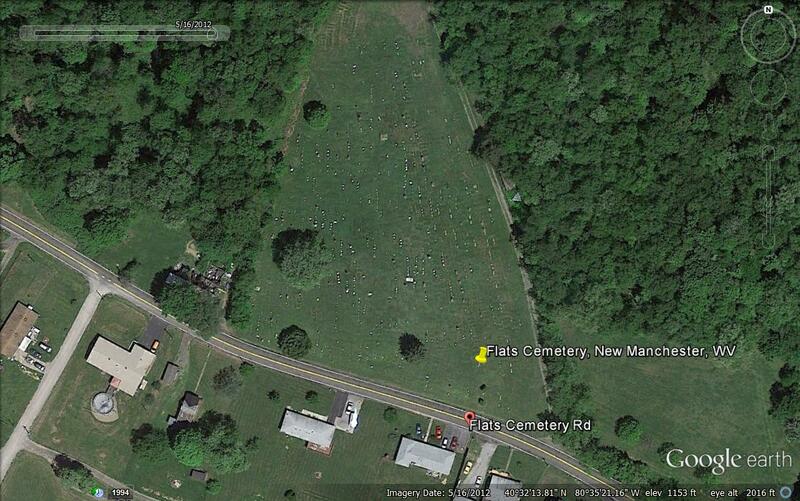 In fact, Flats Cemetery appeared to be right down the road. And it was! The first cemetery that we found on the left side of Flats Cemetery Road was, I think, a Presbyterian cemetery and there were Wycoffs buried there, but none that I could connect to Joachim. After searching for a while, I spied someone at a house nearby washing their car in the driveway. I ran across the cemetery and asked about Flats Cemetery, and received the answer that we needed to travel up the road a bit and that it would be on the right. And there it was, a big triangle of a cemetery cut into the woods butting up against state park land. We walked right up to the stone for Joachim. 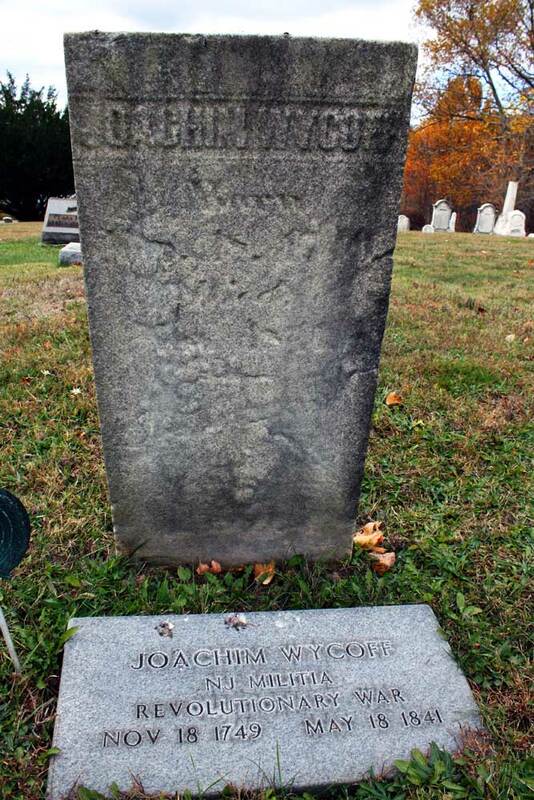 Joachim Wycoff was born 18 November 1749 at Somerset County, New Jersey, to Jacobus Wyckoff and Catelyntje Gulick, perhaps named after his maternal grandfather, Joachim Peter Gulick. One of 14 children, he was the fourth child and, also, the fourth son born to Jacobus and Catelyntje. 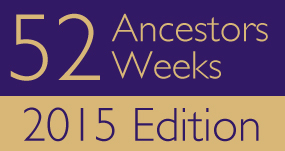 Joachim is the great-great-grandson of immigrant ancestor Pieter Claessen Wyckoff and is my 5th great-grandfather. This short excerpt from the Somerset County Historical Quarterly touches on the many, many different spelling associated with the Wyckoff surname. 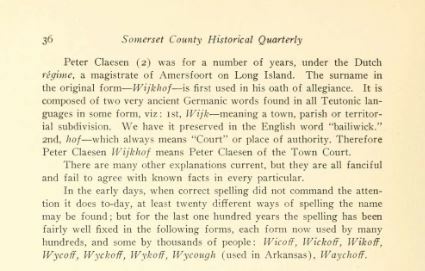 The sentence in the middle of this clipping made me chuckle, especially because we now know that the “of the town court” meaning is the fanciful one and that Wyckoff is most certainly Friesian in origin with a likelier meaning related to the place name in East Friesland from which Pieter originated. I highly recommend that those who are interested in surname studies and the etymology of Wyckoff, read M. William Wyckoff’s, “What’s in a Name? 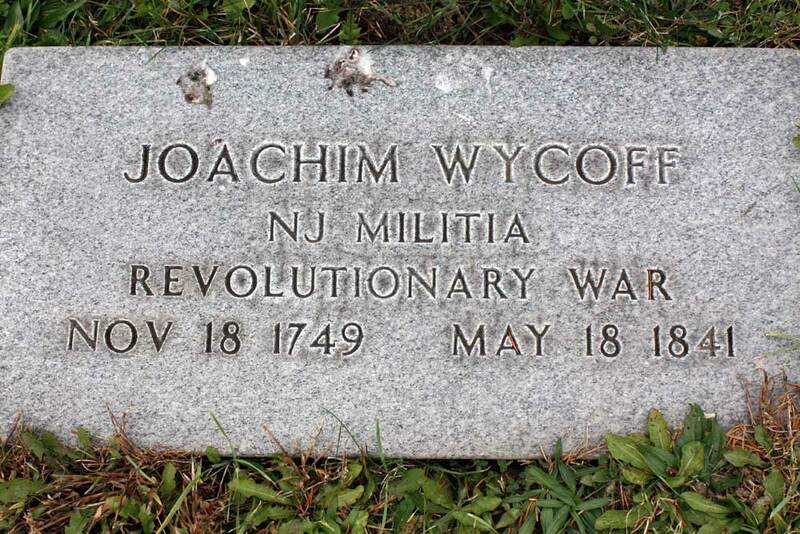 History and Meaning of Wyckoff”. Others wanting to learn more general knowledge about the Wyckoff family should go to this website of The Wyckoff House Museum in Brooklyn or visit their Facebook page to meet other Wyckoffs. 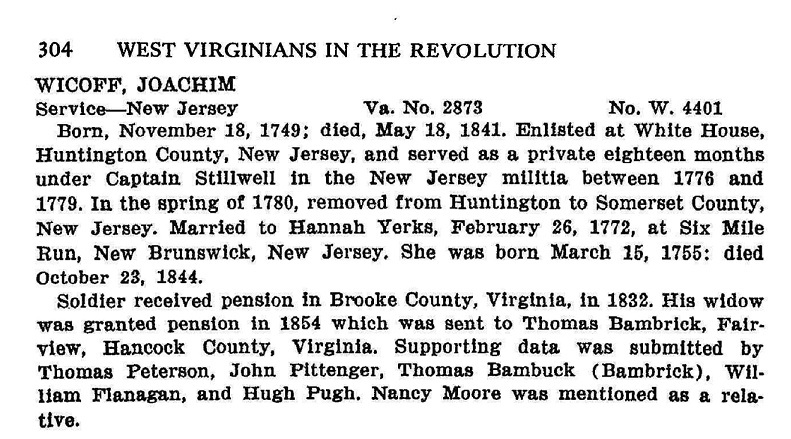 On 26 February 1772, twenty-three-year-old Joachim married sixteen-year-old, Hannah Yerkes, daughter of Silas Yerkes and Hannah Dungan, at Six Mile Run, New Jersey. Hannah gave birth to 14 children, 13 of which are listed in this pension application. In 1776, when New York City was captured by the British, Joachim and Hannah were living in White House, New Jersey and Joachim was drafted into the militia, serving in Captain Stillwell’s company. (I have Stillwells in my paternal line in New Jersey at this time and this just begs for more research!) I am looking at Richard Stillwell, Captain of the 4th Regiment, Hunterdon Militia as the probable Captain and company Joachim served with. 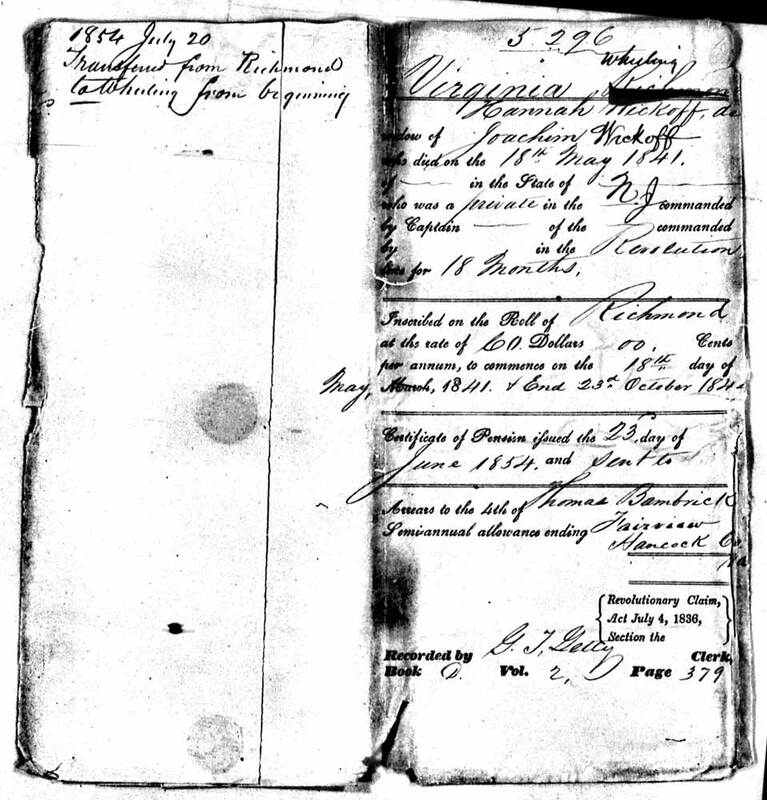 Joachim served a total of eighteen months and as payment for that time served, he was given a land warrant and on 01 July 1802 was granted 294 acres of land in Brooke County, Virginia near Pughtown and Tomlinson Run (now New Manchester). This portion of Brooke County is now Hancock County, West Virginia. From reading pension applications, it appears that those eighteen months were not served concurrently, but as terms such as one month on duty, one month at home, etc. 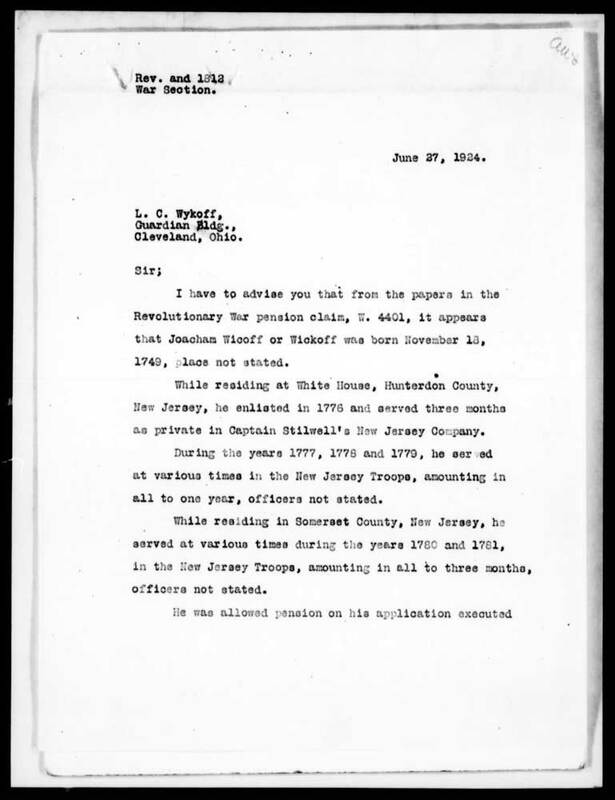 In the spring of 1780, Joachim and family moved to Somerset County where Joachim finished up his enlistment in the militia. 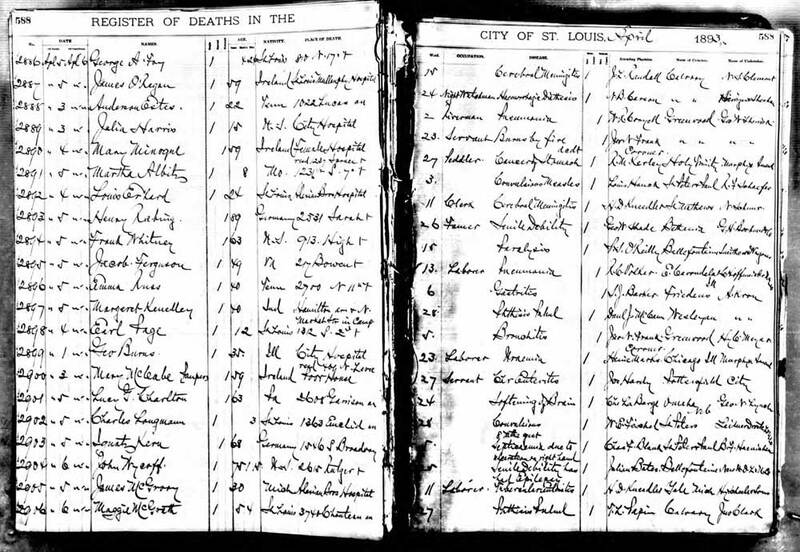 Family bible records, such as the page below, were used to help establish who the family members of the pensioner were. This also helped to establish the fact that Hannah was, indeed, Joachim’s wife so that she would also be permitted to petition for pension monies. Joachim would be granted a $60.00 per year pension that would transfer to Hannah after his death and then, because of a provision for Hannah’s living children after her death, would be divided between Joachim and Hannah’s surviving children after her death. Those children were Hannah, Cornelius, and Agnes “Nancy”. 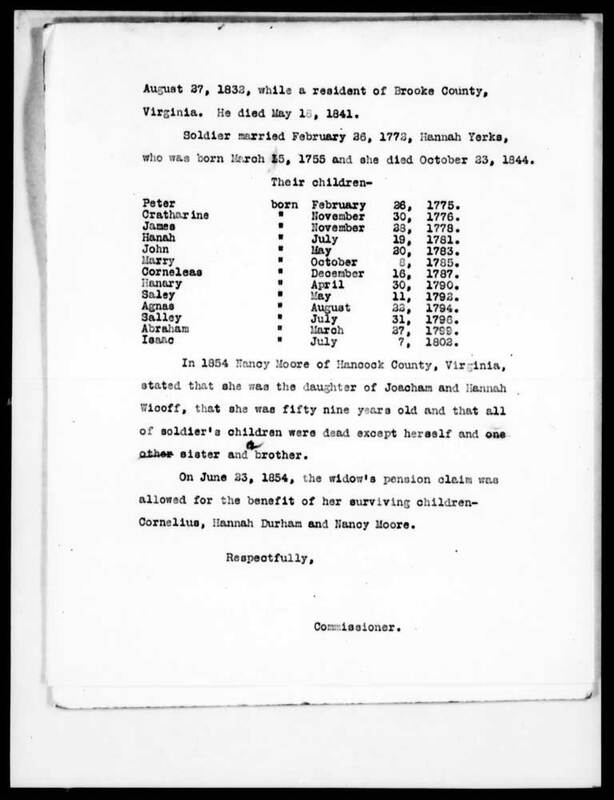 Of these three surviving children, Hannah married a Richard Durham who hailed from Fayette County, Pennsylvania. 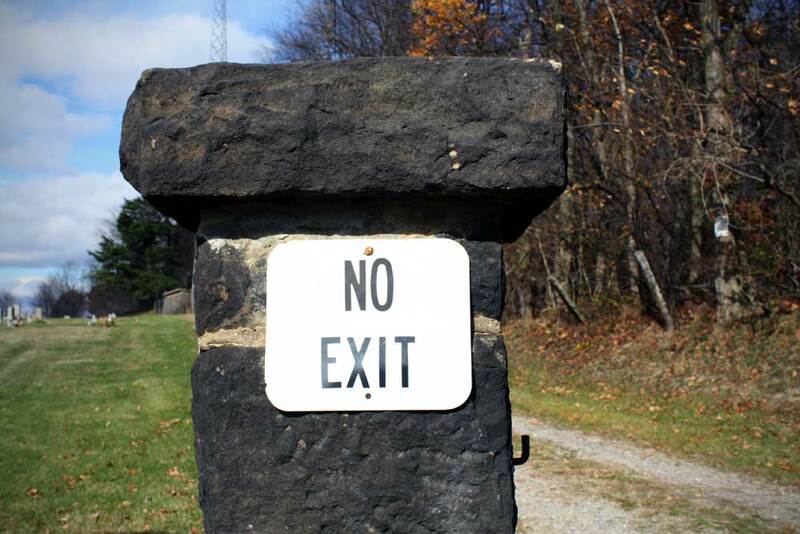 They removed to Ohio and had nine children. 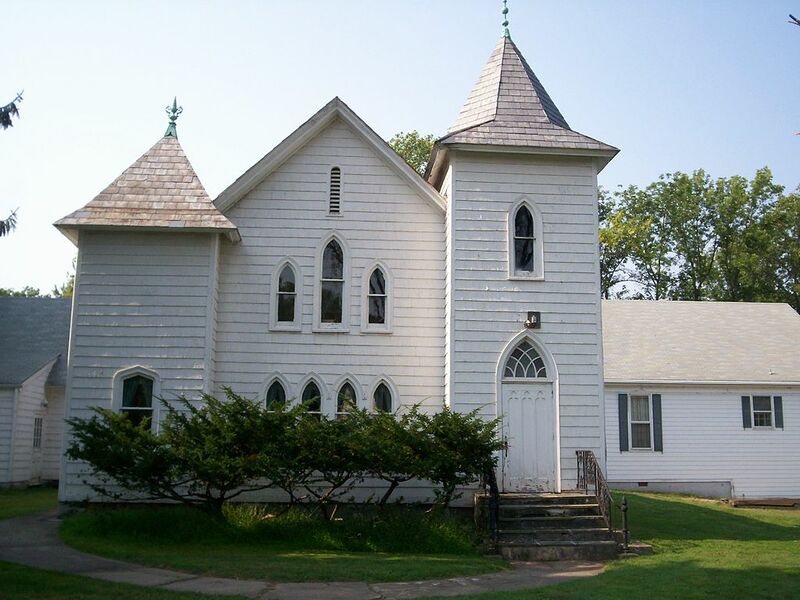 Cornelius, my line, and my 4th great-grandfather, married Leah Critzer on 20 February 1810. 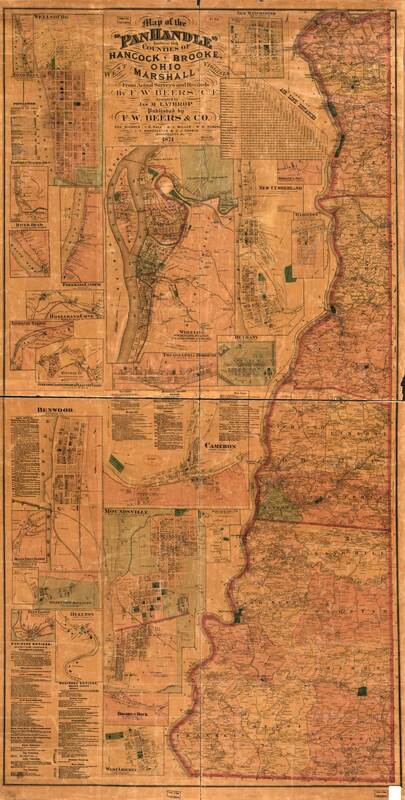 They lived in Ross Township, Jefferson County, Ohio and had 12 children, including Levi, my line, born 22 November 1825. Cornelius died, 28 November 1867, and is buried in Shane Cemetery in Jefferson County, Ohio. Leah died, 17 October 1869. I haven’t found a record of where she might be buried. Also, of particular interest, is Agnes “Nancy”. 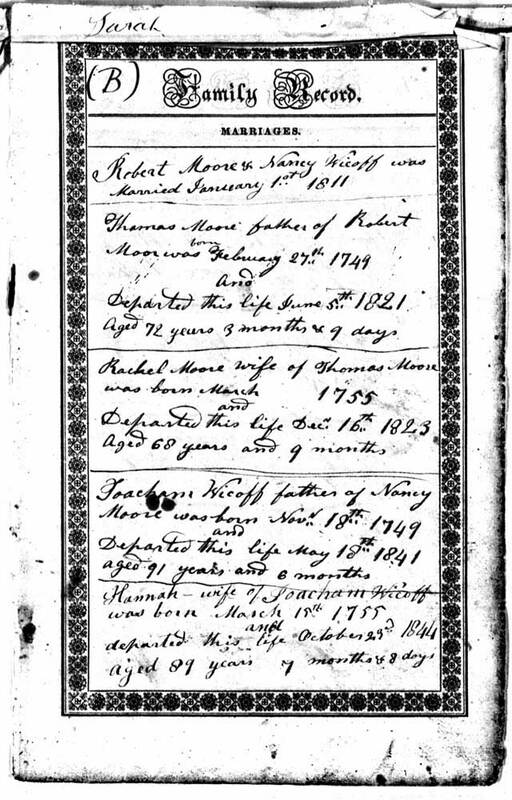 In 1811, Nancy married Robert Moore, who was the son of Captain Thomas Moore (another Revolutionary War veteran) and Rachel Phillis, who is suspected to be the sister of my 4th great-grandfather, Charles Phillis. 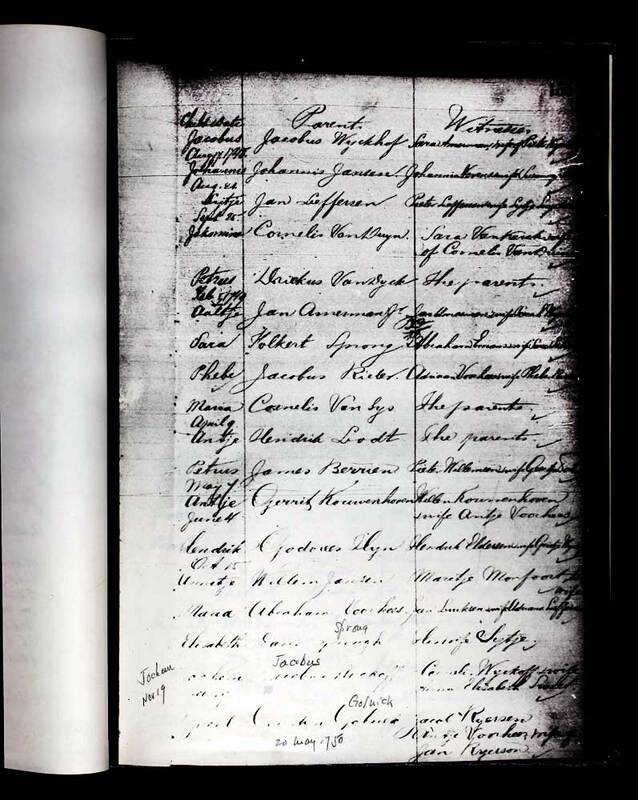 It appears as if Joachim and Hannah were living in the Robert Moore household at the time of the 1840 census. This also helps point to the idea that Nancy was the holder of the family Bible that helped to prove the family relationships. Joachim died, 18 May 1841, and Hannah on, 21 October 1844. Although Hannah is also supposed to be buried in Flats Cemetery, I did not find her stone while we were there. The optional theme for this week was “How Do You Spell That?”.